NETWORK FINALS: All of CBS’s ratings adjusted to reflect the network’s NFL overrun: 60 MINUTES gained 0.5 to 2.8, NCIS: LA (1.5) and MADAM SECRETARY (1.0) each rose 0.1, and ELEMENTARY, which didn’t start airing in most of the country until almost 11PM, rated at 0.7. SUNDAY NIGHT FOOTBALL ended up at 6.2. In addition, SON OF ZORN added 0.1. CABLE HIGHLIGHTS: AMC’s THE WALKING DEAD continued its slide, down 0.27 to 4.90 (and down a huge 3.46 from its season premiere just 5 weeks ago). 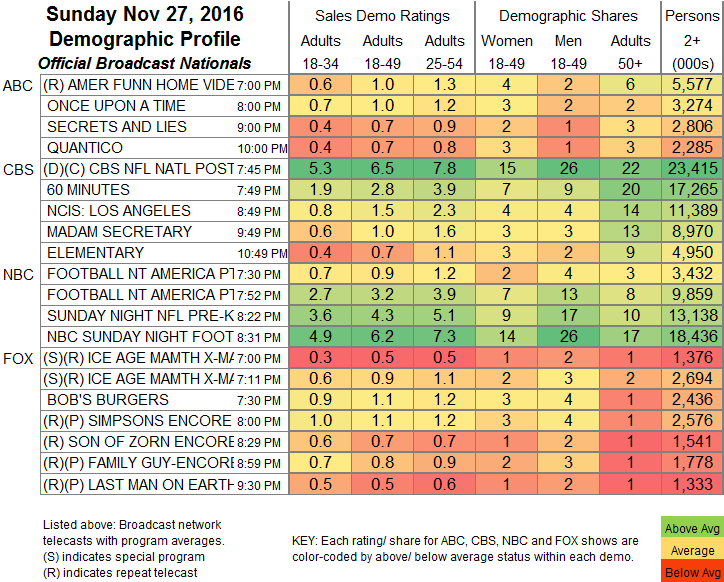 TALKING DEAD went up 0.02 to 1.71, and COMIC BOOK MEN fell 0.09 to 0.29. HBO’s WESTWORLD is hitting its stride, up an impressive 0.22 to 1.02, with DIVORCE up 0.07 to 0.25 and the season finale of INSECURE up a tenth to 0.26. Hallmark’s holiday movie de jour JOURNEY BACK TO CHRISTMAS was at 0.85. 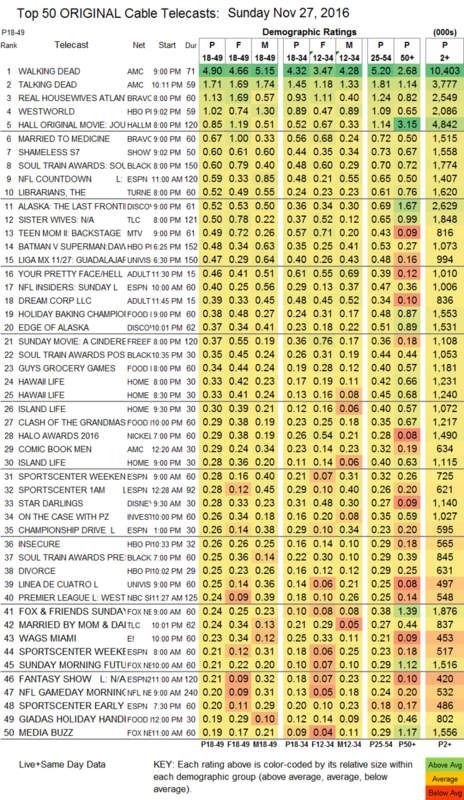 On Showtime, SHAMELESS gained 0.11 to 0.60, and THE AFFAIR slipped 0.02 to 0.15. TNT’s THE LIBRARIANS ticked down to 0.52. On Adult Swim, YOUR PRETTY FACE ticked down to 0.46, and DREAM CORP LLC was down 0.02 to 0.39. USA’s EYEWITNESS ticked up to 0.17. Bravo led the unscripted side with REAL HOUSEWIVES OF ATLANTA up a tenth to 1.13, and MARRIED TO MEDICINE also up a tenth to 0.67. There were a pair of awards shows with simulcasts: the home network for the SOUL TRAIN AWARDS was BET at 0.60 (the POST-SHOW was at 0.35, and the PRE-SHOW was at 0.25), with simulcasts on VH1 (0.17), Centric (0.05/169K) and Logo (0.02/45K), while the HALO AWARDS were based at Nickelodeon at 0.29, with simulcasts on Nicktoons (0.03/185K) and TeenNick (0.04/256K). On Discovery, ALASKA: THE LAST FRONTIER climbed 0.04 to 0.52, and EDGE OF ALASKA was up 0.03 to 0.37. TLC’s SISTER WIVES returned at 0.50, and MARRIED BY MOM & DAD was at 0.24. An MTV TEEN MOMS BACKSTAGE special was at 0.49. On Food Network, HOLIDAY BAKING CHAMPIONSHIP ticked up to 0.38, GUY’S GROCERY GAMES gained 0.04 to 0.34, and CLASH OF THE GRANDMAS was down 0.03 to 0.29. E!’s WAGS lost 0.02 to 0.23.